Easter is a collection of contradictions, isn't it? We get to Good Friday after 6 weeks of plain, undecorated liturgy only to have an even more sparse liturgy, chock full of the bottom-line basics. Sights and sounds are harsh - there is nothing pleasant about 3pm on Good Friday in any Catholic church. Statues are covered, music is subdued, the congregation's standing time seems to go on forever making legs stiff and children impatient. There is the adoration of the cross, petitions for all of everything, then Communion and we file out. Done. Dead. Fast forward 24 hours and the church is transformed, almost unrecognizable in it's relation to the previous space. There are flowers and candles everywhere, hours seems like minutes, there's greenery, incense (at least in our parish), bells, music, reds, yellows, whites - the senses are overwhelmed in the contradiction. And we process joyfully down the aisle of salvation history, re-learning and celebrating the miraculous marvels of our loving and living God-Man. I sense that so much more is going on in my soul than I allow myself, or even have the capacity to consciously comprehend. And I move through my daily routine now, as if nothing happened. But the world is changed, different in a way only those living in Christ can sense. If we have allowed it, we have been moved and changed, just as Isaiah exhorted us to "...enlarge the place of your tent, stretch your tent curtains wide, do not hold back, lenthen your cords, strengthen your stakes...". Morning has broken upon us after a particularly long and arduous night, and I am glad, content. We were made for this. We are not a Calvary People, but an Easter People. We cannot have one without the other, but we are not to be frozen, stuck in death and despair. We were made for the fullness of glory and life. 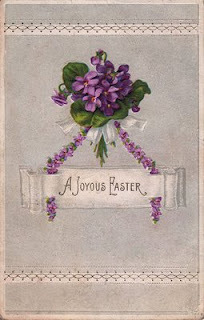 Sufferings are not always relieved after Easter Sunday - but there is a lightness in my heart that I pray is in yours as well. And that right there, friends, is the contradiction of following Christ. Light in the midst of the darkness of pain. Joy in suffering. Good Friday's cross with Easter Sunday's empty tomb.